Ironman Tallinn, the second race of the weekend, was a new addition to the Ironman Calendar. It drew a field of over 1,100 for the standard allocation of 40 Kona slots. As with any new race this will limit the analysis due to a lack of historical results for comparison. I’ve pulled in some results from Frankfurt and Texas this year to offer some context for the charts. Update: the initial result set had erroneous age group swim and overall times which have now been corrected. The changes don’t have a huge impact on this analysis. 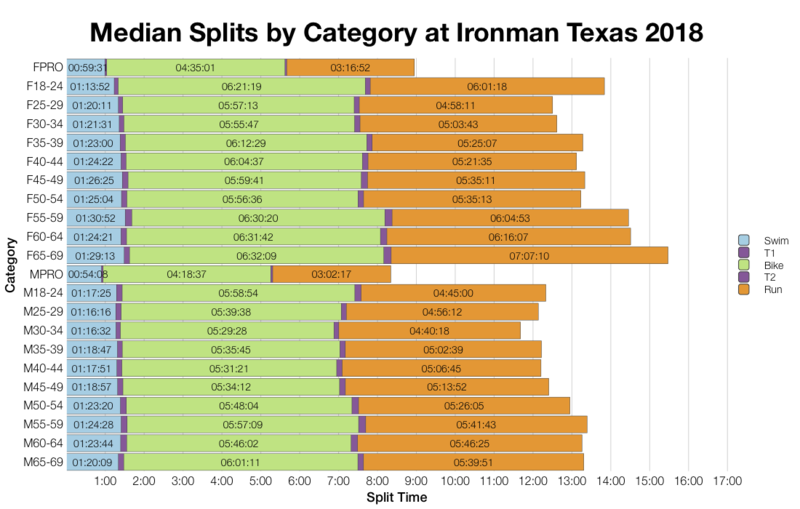 Before we review the results it should be noted that I’ve typically used Championship races like Texas or Frankfurt for comparisons with new races. This year Texas was slightly shorter than usual and Frankfurt was slightly longer than usual meaning their charts are slightly skewed by this. We can still compare, but should do so bearing this in mind. 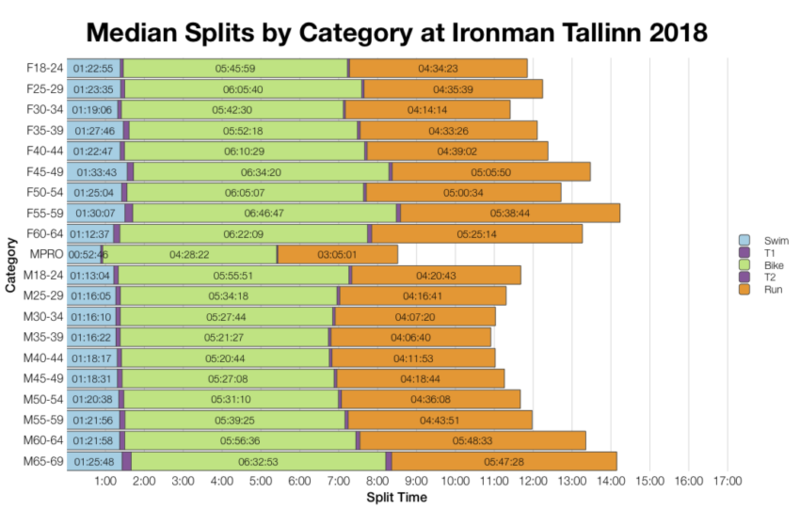 The left skew of each of its histograms suggests that Tallinn was quite a fast race. Certainly faster than (a slower year in) Frankfurt, although not by a huge amount. Not as fast at the front of pack as Texas, but much faster at the median. I can’t say how much of this is course and how much athletes, but the impression is of another quick European Ironman. A few more years of racing will tell more on that front. Comparing DNF rates for a few of this year’s races shows that Tallinn had quite a high level of DNF in it’s swim, but them lower bike and run DNF numbers. Overall the rate of DNF at Tallinn was low. Comparing age group medians shows similar features to the distributions. Faster run medians in particular over Texas and faster bike medians than Frankfurt. 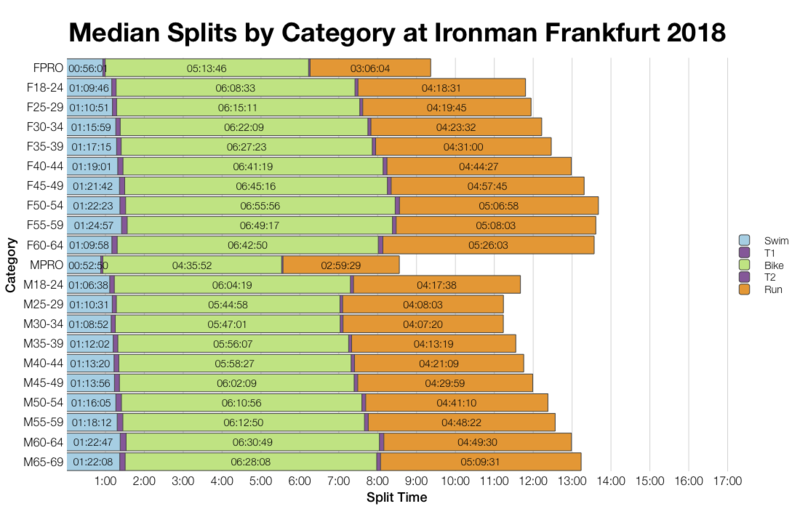 In the latter case the regular Frankfurt course would likely come out slightly faster. There was a very wide distribution of Kona slots by nationality at Ironman Tallinn. The race looks to have drawn a varied field, with Russia topping the table by athlete numbers. 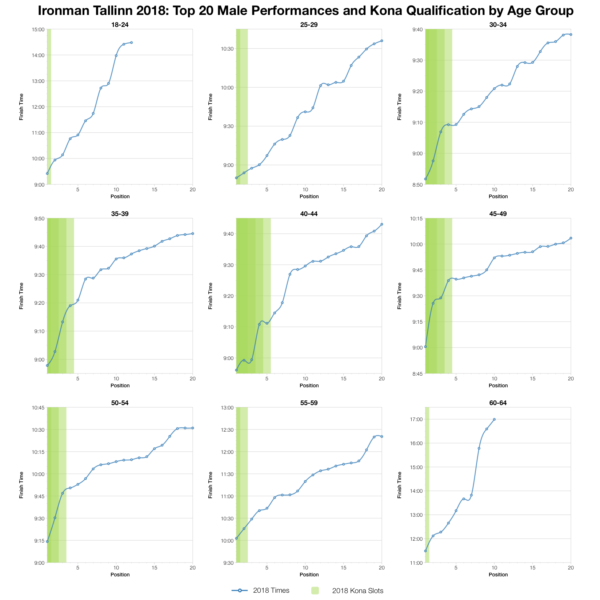 Partially reflective of the size of the field we see some steep drop offs in times over the age group top twenties. 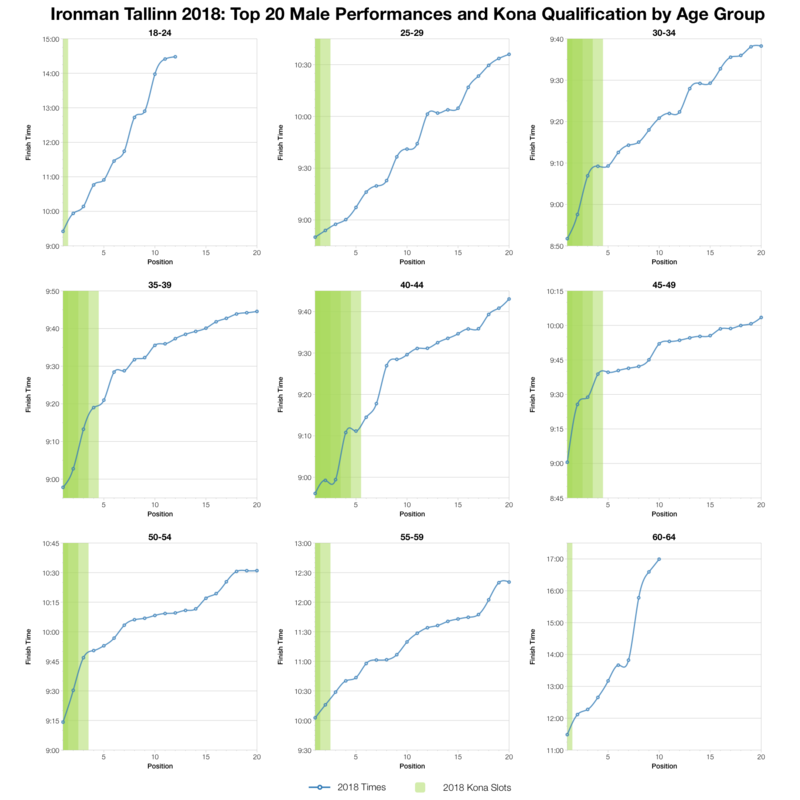 There are a lot of fast Kona qualifying times, but as we move back from the top 5 there can be big gaps in times, particularly among the male age groups. There looks to have been a handful of strong front of pack athletes claiming many of the slots – from a qualification perspective this was definitely a fast race. 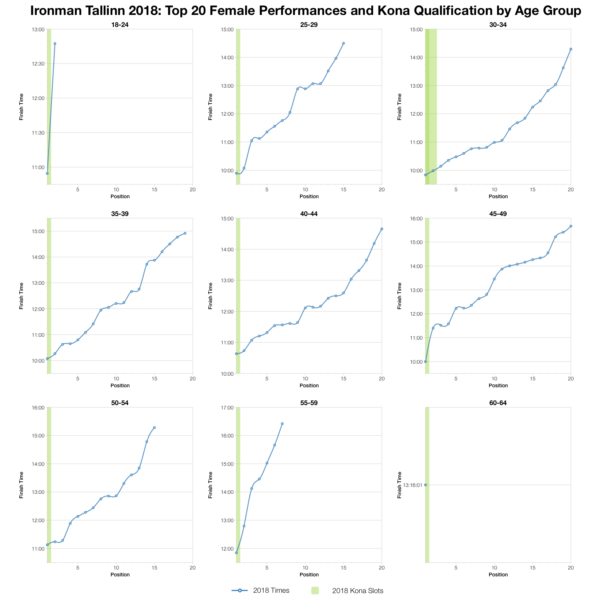 I’ve estimated the allocation of Kona slots based on the start list and from that likely automatic qualifying times in each age group. Final numbers may have varied and roll down will affect the qualifying times. You can compare these times with other races on my Kona qualification page. You can access a spreadsheet of the full results from Ironman Tallinn 2018 on my Google Drive.